Happy Monday crafters! How was your weekend? Good I hope. Can you believe its almost Easter? Where have the past 2 months gone? In light of the impending holiday, whether you celebrate it for religious reasons, or because you have children, I've created todays Easter Chick Card. Todays card mostly features a watercolour technique. I took a blank notecard, and a sheet of Whisper White card, which I cut into panels measuring 4 3/4" x 3 1/4" and 4 1/2" x 3". Then taking my Hello Honey Stampin' Pad and an Aqua Painter, I applied a wash of colour around the edge of the larger panel. Leave to dry. 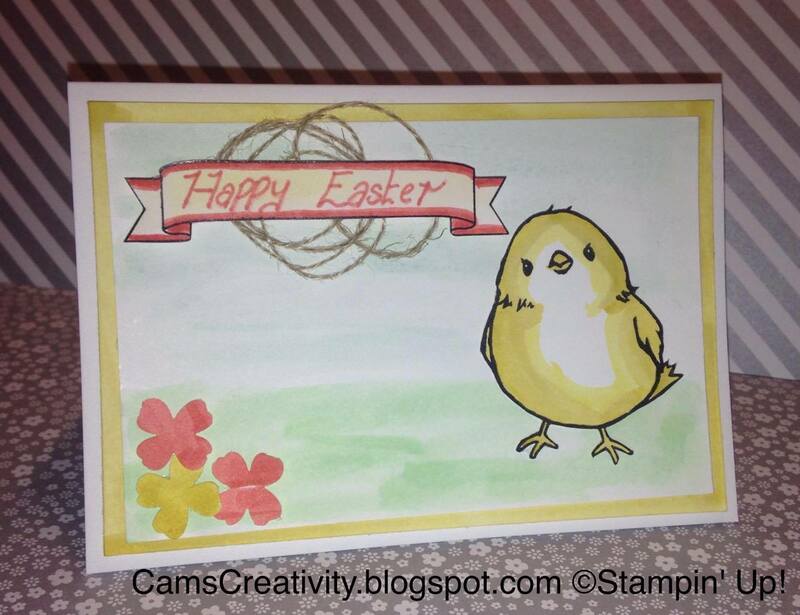 Once dry, using Stampin' Dimensionals, stick in place on the card blank. Hint: To do this you can squish the centre of the closed Stampin' Pad slightly, pressing the ink onto the lid, then taking the loaded Aqua Painter, pick up some of the ink from the lid, and apply to the card squeezing the Aqua Painter slightly to release some water. Then, using the same technique, a Cucumber Crush Stampin' Pad, and a Bermuda Bay Stampin' Pad, I applied a wash to the smaller panel to give the appearance of grass and sky. Leave to dry. Once dry, using Snail Adhesive, stick in place on top of the previous panel. Taking some of the remaining Whisper White Card, and Basic Black Archival Stampin' Pad, I stamped out the chick from the Honeycomb Happiness stamp set, and the banner from the You're So Lovely stamp set. Once dry, using the Hello Honey Stampin' Pad and Aqua Painter, I applied a wash of colour to the banner and the chick, adding more colour to the beak and feet, and to imitate shadow. Finally, taking a Calypso Coral Stampin' Write Marker, I added the greeting, and highlighted the edges, of the banner, before cutting out both the banner and chick. 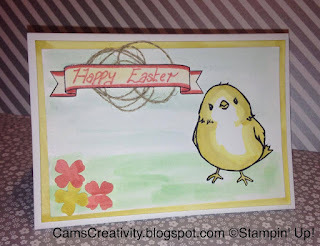 Using Multipurpose Liquid Glue (Tombow), I then applied the chick to the card. The banner was applied using Stampin' Dimensionals, with a coil of Linen Thread in the sandwich of adhesive. The flowers were created by scribbling a patch of Hello Honey ink (using the Aqua Painter) and Calypso Coral onto Whisper White card, punching out using the flower punch from Itty Bitty Accents Punch Pack. The 3D flower effect was achieved by pressing into the centre of each flower with a Simply Scored Stylus, whilst on a Stampin' Pierce Mat. These were then applied to the card using Tombow.